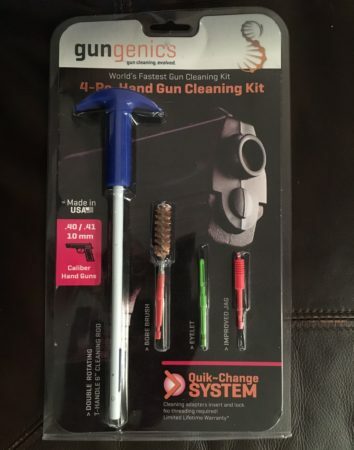 Gungenics has recently released their patent-pending Quik-Change System gun cleaning kit. The Quik-Change system is designed with a quick attach, quick disconnect locking mechanism on each of the cleaning components. Contrary to traditional threaded components, the Gungenics Quik-Change System is a simple push/pull on and off design. Gungenics was at SHOT Show 2016 and have sent us a pistol cleaning kit for us to review. For the last several months I’ve had the opportunity to use the Gungenics Hand Gun Cleaning Kit on my duty and off-duty pistols. Though initially somewhat skeptical I have found the Gungenics kit to be durable and easy to use. Founded by a former U.S. Marine veteran, all Gungenics components are proudly made in the U.S.A. Read on for our complete analysis of this uniquely designed cleaning kit. 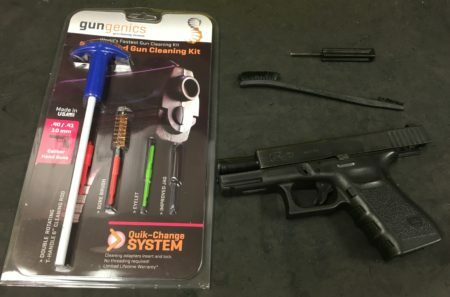 The Gungenics 4-piece Handgun Cleaning Kit. The symbol Gungenics chose to represent their products is a partial DNA strand. The company’s motto is: “gun cleaning. 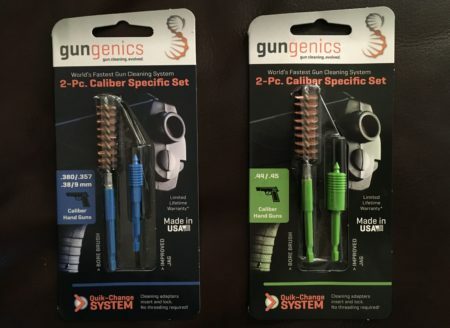 evolved.” The design concept and final product found in the Gungenics cleaning kits are definitely representative of a new way of confronting the need to clean handgun barrels. To what level Gungenics cleaning kit is evolutionary will be left up to those who investigate Gungenics products, but the fact is they do represent a new idea on an old concept. Here are two different 2-piece Caliber Specific Sets. Notice the color-specific components for easy caliber identification. The T-Handle Cleaning Rod and Eyelet Jig are universal for different handgun calibers, while the Bore Brushes and Improved Jags are caliber specific. Gungenics offers separate 2-piece Caliber Specific Sets for different calibers. Gungenics also offers customers a single caliber-range specific bore brush for $4.29. The 4-piece Hand Gun Cleaning Kit offers the best value of all the options. All the cleaning components are color-coded for easy identification of their specific caliber-range. By this I mean similar calibers that may be slightly different. For instance, I requested the .40 caliber cleaning kit to test on my duty and off-duty Glock 22 and Glock 23 in .40 caliber. The .40 caliber Cleaning Kit (pink) is designed for .40 caliber, .41 caliber, and 10mm handguns. Likewise, the 9mm cleaning kit (blue) is designed for .380 caliber, .357 caliber, .38 caliber and 9mm. There is also a .44 caliberand .45 caliber cleaning kit (green). Each caliber range is also stamped on the side of each cleaning component. Overall the cleaning kit concept and design by Gungenics is not only creative, but very practical as well. With the 2-piece caliber-range specific sets to go along with the 4-piece Handgun Cleaning Kit, the user can be ready to clean a wide variety of handgun barrels in a short amount of time. The T-handle Gungenics cleaning rod with unique locking bar. The Gungenics handgun cleaning rod comes with a double-rotating T-handle, and is 6-inches long. The rotating handle is also elongated and slightly wider than many competitors . This provides the shooter protection from pinching their fingers against the barrel or firearm while brushing out the shorter barrels on handguns. On the side of the cleaning rod is a 2-way locking bar, located just above the cleaning component receiving end. The bar may be manually activated to accept the cleaning component, or the user can simply give a slightly forceful push to insert the cleaning component and lock it into place. There is no more concern about stripping threads, particularly on plastic parts. Instructions are simple and include diagrams. The receiver on the cleaning rod is rectangular in shape. The cleaning components have a rectangular end to properly insert into the cleaning rod, and maintain a tight connection. Once the cleaning part is inserted the locking bar extension falls in behind the rectangular end on the cleaning part providing a tight and secure fit. There is no movement of the cleaning part when properly inserted. When the shooter is ready to remove the cleaning part they simply depress the back of the locking bar to raise the locking extension, and pull the cleaning part free from the cleaning rod. During my evaluation I performed dozens of interchanges between cleaning components with relative ease. Depressing the locking bar allows the cleaning part to be released. 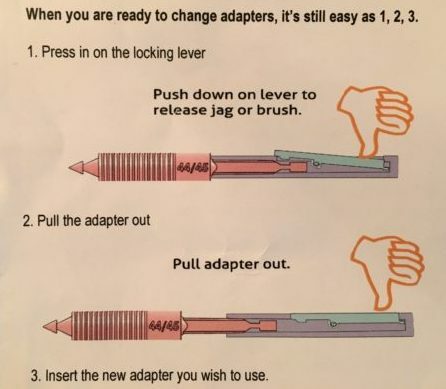 I did notice, however, the locking bar does not extend outside of the cleaning rod tube when a cleaning part is properly inserted and locked in (see diagram above). This is good to prevent anything exposed possibly getting hung up on the chamber or other areas while cleaning. However, removing the cleaning part felt a little counter-intuitive when pressing on the locking bar when its in-line with the Cleaning Rod tube. Using my thumb had the best success in raising the locking bar. The bore brush is made with quality bronze bristles. I believe most shooters expect a more tactile and positive feel, but the Gungenics locking bar works as designed. Despite this minor complaint, when I pressed down near the back of the locking bar I could unlock and remove the cleaning part. Apparently, enough skin squeezes into the locking bar slot to raise the locking bar. I did find, however, my thumb was more successful than a finger to accomplish the unlocking procedure. The Gungenics bore brush was easy to use, and quite effective. The bore brushes are designed with the integral Gungenics locking attachment. 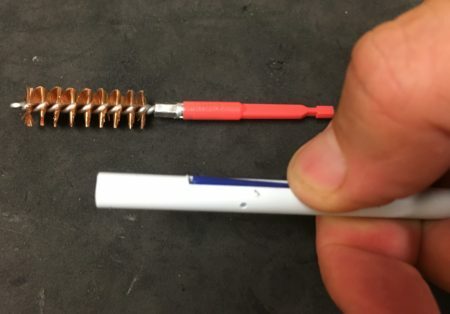 To ready the bore brush for use the shooter simply needs to insert the bore brush locking attachment into the receiving end of the cleaning rod until there is an audible and tactile click. The glass-reinforced nylon tube relieves any concerns about scratching the barrel during cleaning. Made with quality bronze bristles, the brush works as expected in cleaning out and breaking up gun powder residue and brass shavings from fired bullets. 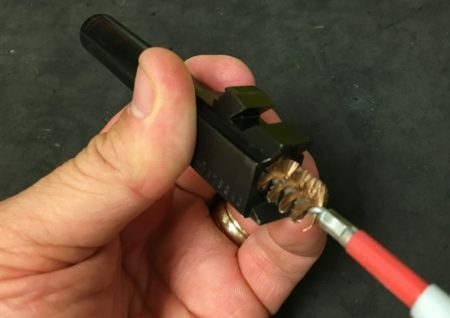 Users should be cautious of using solvent with the bronze bore brush, as it will begin to eat away at the bristles and make it appear the copper is never getting fully cleaned out of the barrel. I would not be surprised if Gungenics comes out with a nylon bore brush to complement their bronze option. The eyelet jig has teeth inside the eyelet for better patch gripping. The eyelet jig is universal among the larger pistol calibers, and is green. 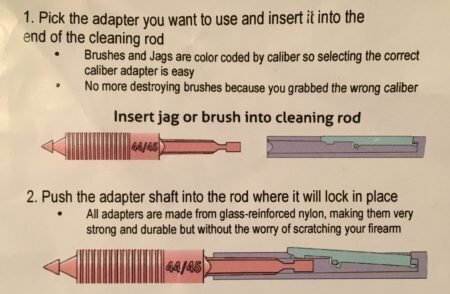 This appears to be the only departure in the color-coding for cleaning components, but makes more sense than having multiple colored eyelet jigs that perform the exact way across the caliber spectrum. Inside of the eyelet itself, Gungenics added small “teeth” at the opposite ends of the opening. This creative and small extra feature helped keep the patches in place ensuring a more uniform cleaning. Made from glass-reinforced nylon the eyelet jig has the integrated Gungenics locking mechanism like all the other components. It is sturdy, functionally capable for patch work, and should provide the user longterm use. The improved jag worked well, but the millimeter wide area where the spearhead attached to the body may become a weak point. The improved jag is also glass-reinforced nylon with the Gungenics integral locking mechanism. The improvement appears to come from an elongated section behind the spear point. This section has more slotted rings than typical brass jags. This tends to provide a greater grip on the patch, as well as giving an extra texture for additional cleaning as the jag passes through the barrel. This is the one component I would keep an eye on after prolonged use. The spear point is surprisingly strong, considering how narrow its base connection is. However, after prolonged use, and repeated pressure and movement from the user placing patches on the jag, this could become a breaking point. Switching between cleaning components was significantly faster than traditional parts. My initial skepticism in the Gungenics cleaning kit has been removed. I found the unique integral locking system to be creative, adequately secure, and relatively easy to interchange parts. The color-coded cleaning components made identification for different calibers much easier. Perhaps most important of all, the Gungenics components work as intended. Most modern firearm cleaning kits are made of metal or plastic, with threaded components. Threading must be lined up to successfully mount components. Unfortunately, threading can be easily started off-track and result in damage to the threads. This is especially true if threading a plastic component to a metal handle and vice versa. Once damaged too much the components are useless. The Gungenics integral locking system was easy to learn and use, although I stand by my previous observation that the press down of the locking bar is counter-intuitive. 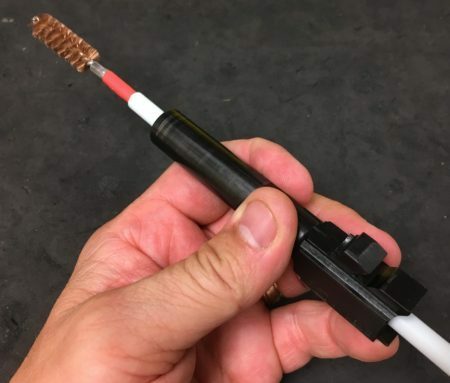 If you get past that minor preference, I believe shooters will enjoy the quick-change, quick-identification characteristics of the Gungenics cleaning components. The elongated and wider handle on the cleaning rod was very much appreciated as I never smashed my fingers on the barrel when the tension from the cleaning component ceased once the component made it completely out of the end of the barrel. Based upon all my testing I would have no reservations of recommending the Gungenics Cleaning Kit. Very interesting. I’ll have to pick me up a kit. Thanks for reading Alexander, I think you’ll enjoy the Gungenics cleaning kit.